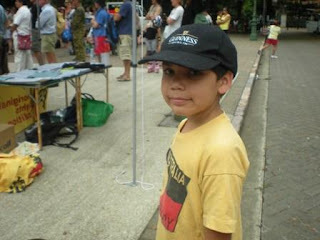 Michael at Brisbane Invasion Day 2009 march. He asked me "Mum, all the people who celebrate Australia Day, don't they know about the Aborigines?" Mick Dodson, Australian of the Year 2009 in his acceptance speech told how he believed that 26th of January should not be Australia Day. Linda Burney, in an interview with Fran Kelly on Radio National, told how while she was unable as an Aboriginal woman to celebrate Australia Day in the past, today she believes that we should stick with the day. She argued that it is possible for the meaning of the day to evolve to one that is more inclusive of others (including Indigenous People). Her and Prime Minister Kevin Rudd are on the same page. Is it possible to continue celebrating on the 26th of January with a clear conscience? Are we just being difficult? Just being wowsers? Does it really matter that a) on the 26th of January the soveignty of our nation was stolen and b) we didn't actually become a nation, only a colony of Great Britain? Perhaps I'm just being pedantic. Isn't it enough that the PM said Sorry, the Australian of the Year is an Indigenous person, there a numerous Indigenous politicians (in states/territories), a couple of Indigenous people have a few gold medals now. Can't we all rally around the flag?? Can't we just get over it??? Well - I guess that's the beauty of being human. We get to create our symbols. The flag, the day, everything is created. None of its natural or truthful. So bugger it, I think I'll stick with marching on the 26th of January, and fight and wait, patiently and non-violently, for the CHANGE. Always was, Always will be…. Aboriginal Land.